True Vintage midi length dress...lovely item Label says 16 ( but more like a modern Size 14) 1970s casual dress Condition is Used. Vintage Original 1970's Vibrant Yellow/Green Cotton Belted Dress - 12-14. Bold and vibrant floral print in yellow and green. Fabric - cotton. Waist - 29". Shoulder to Shoulder - 18". Length from Shoulder to Hemline - 44". Size - 12 -14 approx. Matching fabric belt. Two button front fastening. To fit size 14, height 38". Polyester (?). fabric, fabric covered buttons all the way down front and at sleeve cuffs. Good condition. Could also be worn as a pyjama top. Vintage Original 1980’s Knitted Batwing Fit And Flare Jumper Dress M On Trend. Condition is Used. Dispatched with Royal Mail Signed For® 2nd Class. Great original 1980’s jumper dress with batwing sleeves. Perfect for this season paired with knee high boots. In very good vintage condition. Fully lined. Please check the measurements to ensure the correct fit. Armpit to armpit measures approx 18” with done stretch. Length 42”.! Vintage pristine condition unworn 1970’s Clark’s shoes made in England. Brown suede & leather mix with super cute shoe lace tie details. 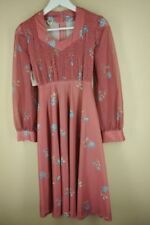 Fabulous 1970's grey multi floral print knee length dress. Scoop neckline with gathers and notch to side with tie fastening. Back zip fastening. SIZE: Labelled 14 - Chest: 45". Length: 26" - Will fit up to a UK 16. Excellent Condition. Condition is Used. Unusual fasten 3 buttons plus collar, only and pretty pattern. In very good condition. It is a petite size 10. It was a favourite shirt decades ago. From a smoke and pet free house. True Vintage 80s dress...with shoulder pads! Secretary / Geeky casual dress! Size 14 Condition is Used. Style: retro. Colour: pink, white and black. Is the item clipped to the mannequin (Size 12) to illustrate best fit?yes. Unless otherwise stated, belts and accessories are not included and are not for sale. In a lovely pale apple green shade. Dress is fully lined. Chiffon embroidered over top (integral) with chiffon sleeves (unlined). Vintage hat from the 1970s. Pill box design, made from a soft felt fabric. Comb attached inside for a better fit. Measurements 54 cm circumference. Lovely vintage condition. I can't see any holes or marks. Your beautiful item will come to you carefully wrapped and sent via Royal mail fully insured. I am uncertain about the exact age of this dress; it looks almost 40s but the acetate fabric seems later than this, more like late 1950s- early 1960s. It is possibly a late 1950s dress that has been altered later in its history. Cream/beige blouse. All-over print. Model is a SMALL for reference. In great condition for its age! 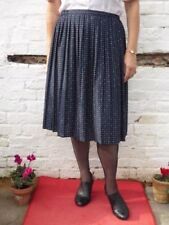 True Vintage 80s blue dress Approx Size 16 Condition is Used. Material: cheesecloth. The dress has batwing sleeves and shoulder pads for structure. Style: secretary. Is the item clipped to the mannequin (Size 12) to illustrate best fit?yes. Colour: red. Unless otherwise stated, belts and accessories are not included and are not for sale. There are a few thread pulls to the fabric but nothing noticeable when worn. SO Audrey hepburn. . A very gorgeous 1960s handbag. Leather outer and inner with hard, possibly manmade handle ~. Perfect for on the go, room for a notebook, makeup, a book to read etc. Very chic minimalist design with gold hardwear. Vintage Cacharel shirt from the 90s. Size: 8 UK Armpit to armpit: 18 inches Measured laid flat. Lovely rusty brown, sheer shirt with a ditsy floral pattern. The shirt is a button down style with 1 breast pocket. The buttons are pearlescent. It is 100% raw silk in a crinkle style. Beautiful designer vintage piece, looks great day or night. In excellent condition. Dry clean only. It’s a classic 1970’s rib top and skirt design, constructed from sturdy polyester; it is not lined. A 90s vintage black corduroy pinafore dress by American brand Talbots. It is 97% cotton and 3% Lycra spandex. It has one hip pocket and there is a zip at the back. It is labeled as a petite size. I believe it would suit up to a petite size 12. Please check these measurements: Chest 37.5" Waist 39.5" Hips 41.5" Shoulder to shoulder 14" Shoulder to hem 45" Length of arm hole 10" It is in good condition with a bit of light wear from being washed and worn. Length Shoulder to Hem: 48". Sleeves: 13". If you like this item make sure you put in your watch list so you don't lose it. Material; 100% Polyester. Is the item clipped to the mannequin (Size 12) to illustrate best fit?yes. Colour: pink and multi. Style: tea dress. Unless otherwise stated, belts and accessories are not included and are not for sale. Style: retro. Is the item clipped to the mannequin (Size 8) to illustrate best fit?yes. Colour: beige. Bust:free fitting due to the cut of the sleeves. Unless otherwise stated, belts and accessories are not included and are not for sale. Colour: lilac. Is the item clipped to the mannequin (Size 8) to illustrate best fit?yes. Unless otherwise stated, belts and accessories are not included and are not for sale. Size:approx 12. Material: synthetic. Is the item clipped to the mannequin (Size 12) to illustrate best fit?yes. Colour: white, beige, pink and blue. Unless otherwise stated, belts and accessories are not included and are not for sale. Size:approx 20. Pattern: abstract. Is the item clipped to the mannequin (Size 8) to illustrate best fit?yes. Colour: white and multi. Unless otherwise stated, belts and accessories are not included and are not for sale. Is the item clipped to the mannequin (Size 12) to illustrate best fit?yes. Colour: brown, beige, black. Waist:35". Unless otherwise stated, belts and accessories are not included and are not for sale. Made in light jersey polyester, interesting swirly blue and green marble print, drop waist, open wide lapel collar, back zip fastening, long button cuffs, drop waist seam. this is an elegant, retro midi dress. A lovely 90s vintage cotton velvet pinafore dress. It has a teal, red and green floral pattern on a black background. It has a zip at the back and two hip pockets. I believe it would suit up to a 20-22, depending on how you like the fit. Please check these measurements: Chest 49" Waist 46" Hips 48" Shoulder to shoulder 18" Shoulder to waistline 16" Shoulder to hem 47.5" Length of arm hole 12" It is in good condition with a bit of light wear from being washed and worn. Is the item clipped to the mannequin (Size 12) to illustrate best fit?yes. Colour: blue and multi. Waist:46". Unless otherwise stated, belts and accessories are not included and are not for sale. Style: retro/secretary. Is the item clipped to the mannequin (Size 12) to illustrate best fit?yes. Colour: multi. Waist:40". Unless otherwise stated, belts and accessories are not included and are not for sale. Size:approm 16. SIZE: Labelled UK 8 - Chest 38". FABRIC: Viscose. This is a very sophisticated yet very retro handmade midi dress. interesting block pattern, thread through belt, side zip fastening. cheers for checking out chickadooli! will fit a UK size 14 approx.